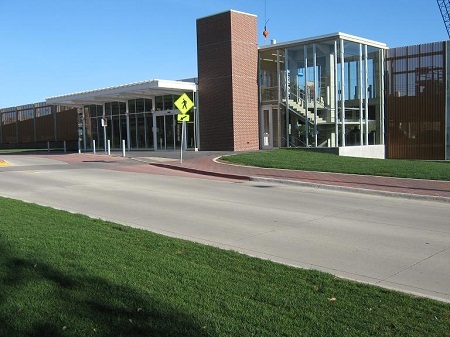 The UNI Multimodal Transportation Center, a multi-level transit facility, is located on 23rd Street, just east of Campbell Hall. The facility replaces the Commons parking lot and four university-owned houses. 28 GM permit spaces at street level with easy access to the facilities, pavilion and the bus stop. 247 A permit spaces on the lower and mid levels. 174 B permit spaces (these are located in the lot adjacent the MMTC). 107 park and pay spaces for visitors, students, faculty, or staff! These spaces are identified by yellow lined stalls with a number on the pavement. In front of each space, there is a green sign with the stall number. 14 handicap spaces. Spaces require a state issued handicap permit as well as a UNI permit (B minimum) for students, faculty, and staff. Parking is prohibited from 1:00 a.m. -7:00 a.m. Prior approval must be made for state vehicles to remain over night. Metered parking stalls can be paid for via the Parkmobile app. Go to our Pay by Phone page to find out how! Students, faculty and staff can pay for up to 10 hours (no overnight parking 1 am-7 am)! Multi-meter pay stations are located at street level adjacent to the stair wells on 23rd Street near Merner at the SE corner, and on Campus Street at the NW stair well. Patrons must remember their stall number and enter it into the machine. Instructions are printed on the front of the multi-meter machine. The silver button located below the red cancellation button offers voice prompts that will guide users through a step-by-step process to complete transactions. Look for the green light at the bill collector before inserting money. The transaction can be canceled anytime prior to your final selection. The machine has the capability to extend the amount of time purchased if necessary. Keep your receipt and enter the stall number along with the code on the receipt. You can then add to the time you have already purchased. A temperature controlled pavilion is located on the south side of the facility, where patrons may wait for city bus service, use rest rooms or gather information about the university community and services. The pavilion hours are Monday - Saturday, 5:30 a.m. until 6:30 p.m. and closed on holidays. Located across the street from the MMTC near the bus shelter are ten bike lockers which can be leased from Parking Operations. Lockers may be leased by the semester or over the summer. Locks are provided. For additional information, contact Parking Operations at 319-273-2710.